This portable and easy-to-use reference tool, summarizes information about our precision calibrated natural gemstones range offered directly via our award-winning trade-only website, and through our channel partners. 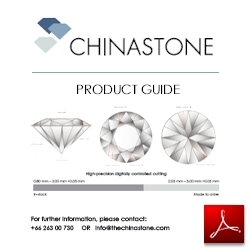 Inside the guide, you will find most current information about our product ranges, technical specifications, colors, and ordering information. The documents in this page use a newer version of Adobe Acrobat. If you have trouble viewing these PDFs. Please download the newest version of Adobe Acrobat. Once you are able to view the Product Guide on your computer screen go to the printer icon on the Acrobat application. Make certain "All" is selected in the Page Range within the Print dialog box. Your printer will print out the entire Product Guide. If you use the print command that accompany your browser you will only be able to print the page that is showing on your screen. You can also save the PDF file to your hard disk for future reference.